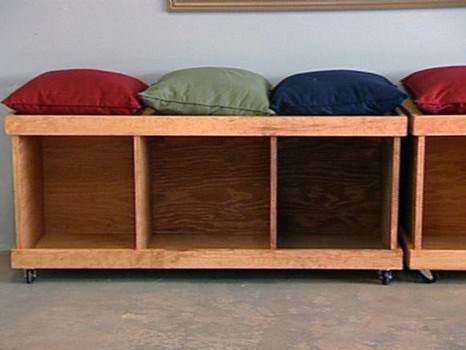 A storage bench is perfect for a hallway, porch or foyer. It not only provides seating for removing boots or shoes, it adds storage for gear, and sports equipment. 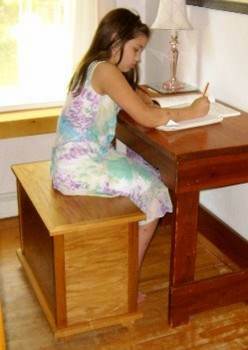 Free storage bench plans are simple and are great do-it-yourself projects. 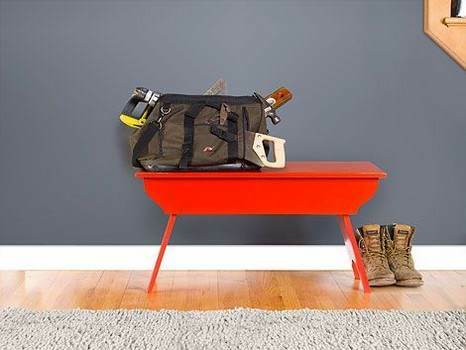 Storage benches can be customized to fit your space. They are freestanding or built-in, depending on your needs. Dress them up with stain and varnish, or choose durable enamel paint for a colorful accent to welcome guests. Free storage bench plans have hinged lids for easy access, while simple cushions may be added for comfort and a decorator touch. Storage benches are welcome seating for a deck or patio, while adding a convenient place for storing backyard games and tools. For outdoor use, choose teak or redwood and resilient water-based stain for long-lasting durability. This is a storage bench built out of plywood with pine trim. It also has casters for ease of moving from place to place. 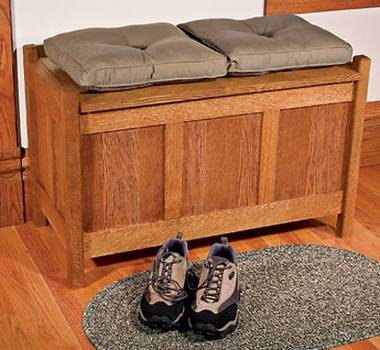 This red oak bench with a pine base offers a place to sit when putting on or removing shoes and a place to store them. THere is a simple plan for a storage bench built completely out of 2x4's. It also has a storage area underneath the seat. 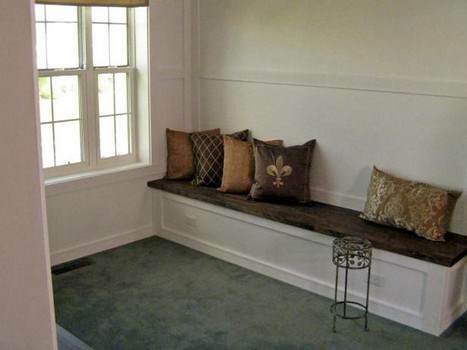 This banquette bench has a hinged top allowing for lots of storage. It can be paired with a dining or kitchen table. 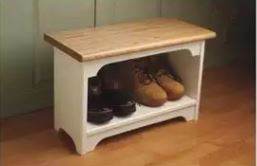 Create your own built-in storage bench with a handsome butcher block top using this plan. This bench has a somewhat slick and modern flare. Half the bench is upholstered while the other half has a wooden drawer. 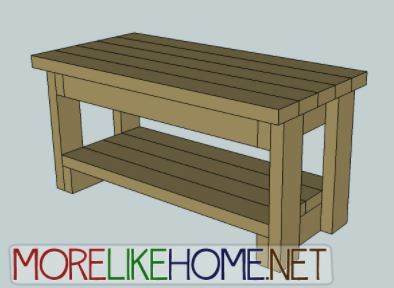 Create a wooden bench that can be built in a single weekend. 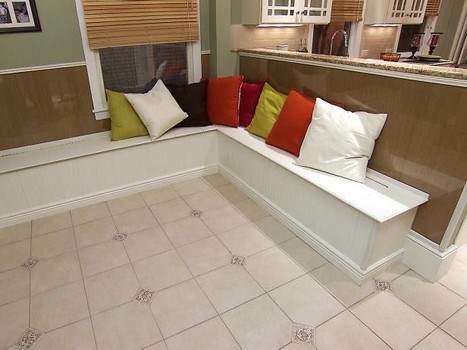 This bench is small enough to fit in tight areas where space is limited. Build this good-looking storage bench using ray-flecked grain of quartersawn wood with this woodworking plan. 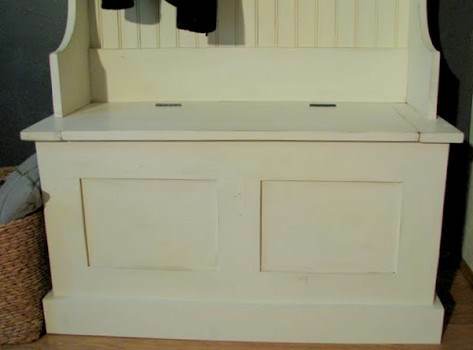 This storage bench can be built with or without the tall back that offers hooks for hanging jackets and hats, plus two handy cubby holes. This is a project for building a long bench with open storage, plus a wall shelf with hooks. Great for a mud room. 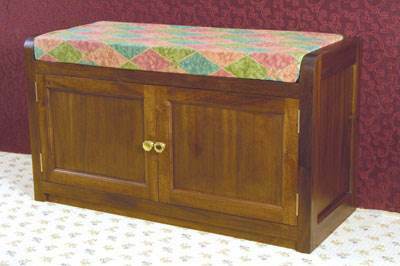 Build an ottoman that has cabinet-style doors that open for storage and a padded top for sitting or resting feet. This wooden storage bench is designed to be strong and sturdy. 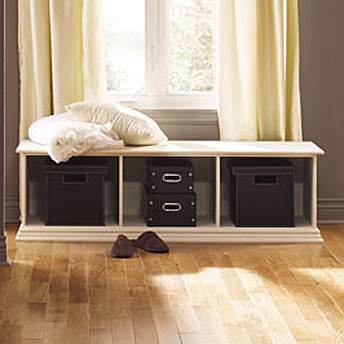 Useful for any room that requires additional storage and seating. This project is for a bench built using MDF. It has open storage and measures 60 inches wide and 18 inches high.